NEWLY-DEBUTED PERFORMANCEJET 2508UF PACKAGES QUALITY, SPEED AND AFFORDABILITY INTO A WIDE-FORMAT, UV-LED PRINTER. 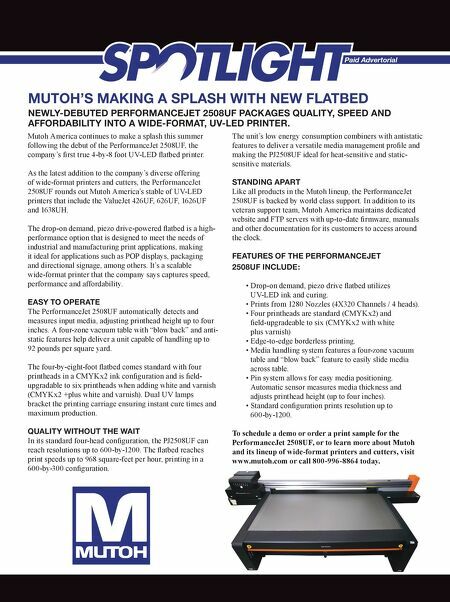 Paid Advertorial MUTOH'S MAKING A SPLASH WITH NEW FLATBED Mutoh America continues to make a splash this summer following the debut of the PerformanceJet 2508UF, the company's first true 4-by-8 foot UV-LED flatbed printer. As the latest addition to the company's diverse offering of wide-format printers and cutters, the PerformanceJet 2508UF rounds out Mutoh America's stable of UV-LED printers that include the ValueJet 426UF, 626UF, 1626UF and 1638UH. The drop-on demand, piezo drive-powered flatbed is a high- performance option that is designed to meet the needs of industrial and manufacturing print applications, making it ideal for applications such as POP displays, packaging and directional signage, among others. It's a scalable wide-format printer that the company says captures speed, performance and affordability. EASY TO OPERATE The PerformanceJet 2508UF automatically detects and measures input media, adjusting printhead height up to four inches. A four-zone vacuum table with "blow back" and anti- static features help deliver a unit capable of handling up to 92 pounds per square yard. The four-by-eight-foot flatbed comes standard with four printheads in a CMYKx2 ink configuration and is field- upgradable to six printheads when adding white and varnish (CMYKx2 +plus white and varnish). Dual UV lamps bracket the printing carriage ensuring instant cure times and maximum production. QUALITY WITHOUT THE WAIT In its standard four-head configuration, the PJ2508UF can reach resolutions up to 600-by-1200. The flatbed reaches print speeds up to 968 square-feet per hour, printing in a 600-by-300 configuration. The unit's low energy consumption combiners with antistatic features to deliver a versatile media management profile and making the PJ2508UF ideal for heat-sensitive and static- sensitive materials. STANDING APART Like all products in the Mutoh lineup, the PerformanceJet 2508UF is backed by world class support. In addition to its veteran support team, Mutoh America maintains dedicated website and FTP servers with up-to-date firmware, manuals and other documentation for its customers to access around the clock. FEATURES OF THE PERFORMANCEJET 2508UF INCLUDE: • Drop-on demand, piezo drive flatbed utilizes UV-LED ink and curing. • Prints from 1280 Nozzles (4X320 Channels / 4 heads). • Four printheads are standard (CMYKx2) and field-upgradeable to six (CMYKx2 with white plus varnish) • Edge-to-edge borderless printing. • Media handling system features a four-zone vacuum table and "blow back" feature to easily slide media across table. 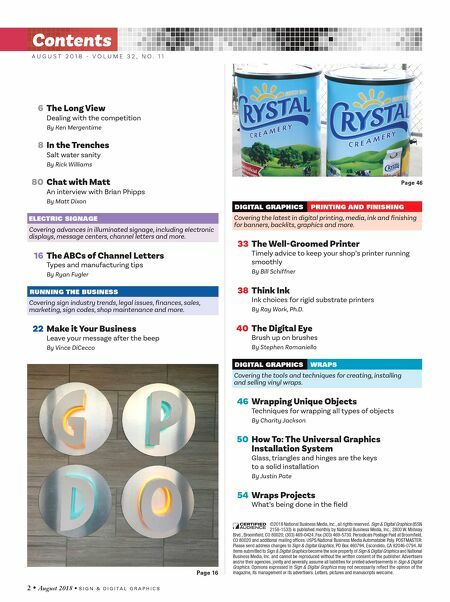 • Pin system allows for easy media positioning. Automatic sensor measures media thickness and adjusts printhead height (up to four inches). • Standard configuration prints resolution up to 600-by-1200. To schedule a demo or order a print sample for the PerformanceJet 2508UF, or to learn more about Mutoh and its lineup of wide-format printers and cutters, visit www.mutoh.com or call 800-996-8864 today.